Here's the entire video, with excellent commentary. Meet the runner --- 1:22 short video about Eliud. Gerry Lingren, Steve Prefontain, Shorter and Liquori. 2-mile in '69. Ducks sweep M1500 at 2010 NCAA's in Eugene. Awesome race tactics. Alan Webb's sub-4 high school mile (Pre Classic, 3:53.4). Prefontaine Classic: Mens 800m 2007 Nick Symmonds! Mens 800M 2008 Olympic Trials. It doesn't get better than this. Go Oregon. Grete Waitz has died at the age of 57 following a six-year battle with cancer. A former Oslo schoolteacher, Waitz won the London Marathon twice, the New York City Marathon nine times and took the silver medal at the 1984 Olympic Games. 18 April 2011 -Boston, USA - A strong wind from the southwest coupled with cool temperatures provided a magic carpet ride today for athletes competing in the 115th Boston Marathon, culminating in the fastest Marathon ever run *. Close finishes in both the men's and women's contests only served to heighten the excitement surrounding America's oldest Marathon. Andrew Wheating first NCAA 1500/800 double winner in over 25 years. Includes article and video of the race. Watch the full race here. Oregon distance runner Matthew Centrowitz has decided to forgo his final season of collegiate eligibility to run professionally.Centrowitz will turn his focus to the 2012 Olympic trials and the London Olympics. TERRE HAUTE, Ind. - Jordan Hasay matched the best finish by a Duck in school history to lead the Women of Oregon to their first top-five finish in three years Monday at the 2011 NCAA Cross Country Championships. Hasay and Villanova senior Sheila Reid waged another entertaining round of their running duels. The two were neck-and-neck the entire race before Reid had just enough at the end to clip Hasay by sixth-tenths of a second. Reid covered the 6,000 meter Lavern Gibson Championship Course in 19:41.2, with Hasay right behind at 19:41.8 in one of the closest finishes in NCAA history. Hasay's runner-up showing matched the best finish by a Duck woman in school history. Leann Warren also took second in 1981. Q & A #34 Who broke Bannister's mile record? When? Barkley Marathon worlds toughest race? 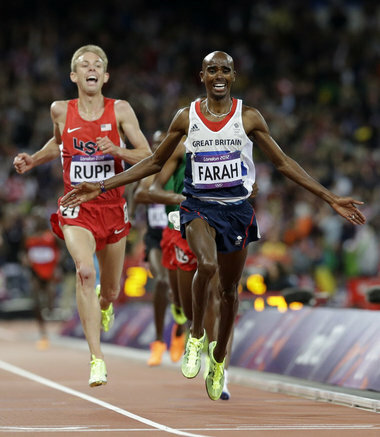 Is Salazar (Oregon Project) intentionally breaking the drug rules? RAY HATTON --- one of Oregon's greatest Master's runner, passes at age 83. Breathe it in (Xenon, that is). Alan Webb retires, kind of. He's now a triathlete. Duck Pack Brings NCAA Title Back to TrackTown! SANTA CLARITA, Calif. - Jordan Hasay's runner-up finish led the third-ranked Oregon women to the 2012 Pac-12 cross country championships The eighth-ranked men took third. Rudisha runs stunning 1:40.91 800m World Record in London! A compact programme of finals highlighted Day 8 of the US Olympic Trials in Eugene on Sunday (1), as the sun broke through after numerous days of rain and clouds. In winning with 13:22.67, Rupp moved another step closer to full 'Oregon sainthood’ by breaking the US Olympic Trials 5000m record of 13:22.8 established forty years ago on the same track by Steve Prefontaine. Finals in both 800m races plus three field events comprised the major highlights for Day 4 of the U.S. Olympic Trials in Eugene, Oregon on Monday (25). Eugene, USA - There’s no place like home, and you could sense from Ashton Eaton’s intensity on the first day of the US Olympic Trials decathlon that, despite the uninviting wet conditions, the 24-year-old Eugene resident wanted to make a bold statement with his neighbors as eye-witnesses. The men’s contest was as much about finding the top three for London as it was an effort of one competitor to help a friend get the A-standard for an Olympic spot. From the outset, it was a quest for Dathan Ritzenhein to clock under 27:45. 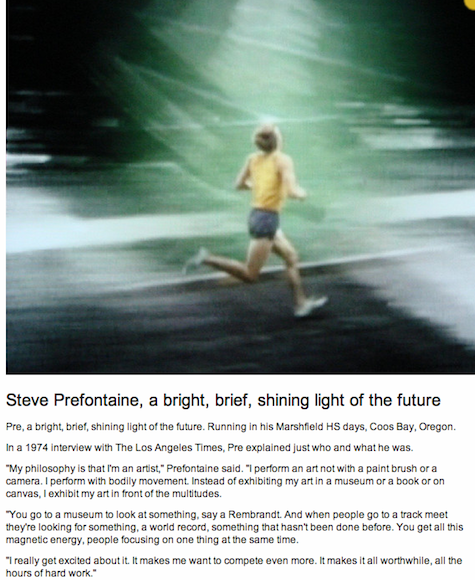 Prefontaine fan? 100's of great pics. Bolstered by a scintillating victory in the 4x400 meter relay, the Women of Oregon scored the most points ever in an NCAA meet by a Duck squad. Unfortunately in the end, Louisiana State came up with more Saturday at the NCAA Track and Field Championships at Drake Stadium. AUSTIN, Texas - Oregon capped a remarkably successful NCAA West Preliminary Rounds meet on Saturday by qualifying 10 individuals and three relays for the NCAA Championships. All told, Oregon will send 31 entries on to the NCAA meet June 6-9 in Des Moines, Iowa. Brianne Theisen broke the Pac-12 record in the heptathlon with the third-best score in NCAA history. Dakotah Keys wins decathlon. Women: Ducks 200 1/2, other way back. Eaton Set new Heptathlon record in Istanbul! with a superb tally of 6645 improving his own World record by 77 points. COLLEGE STATION, Texas - Brianne Theisen used personal bests in the high jump and shot put to break the 30 year-old Canadian national record in the pentathlon Friday night at the Texas A&M Mondo Challenge. Theisen totaled 4,555 points to eclipse the previous Canadian mark of 4,550 points set by Jill Ross-Giffen in 1982. She also broke her own NCAA record of 4,540 points set at the Gilliam Indoor Track Stadium at the 2011 NCAA Championships. "I haven't competed in 10 months since I was hurt during the last outdoor season," said Theisen. "We came to this meet to break up training and to see where I'm at. Apparently it's pretty good. Becca Friday ran a 2:05 800 Friday night in the distance medley relay.